It's been a busy couple of days for me. I had 2 team meetings on Monday - lots of stamping, sharing, chatting and yummy food, and then my last Sale-a-Bration workshop today. Now I'll be spending the rest of the week getting ready for my launch party on Sunday. I have 50 lovely ladies coming to celebrate the start of the new Autumn-Winter Mini! But, I'm getting ahead of myself. We still have 2 more days to Sale-a-Brate! 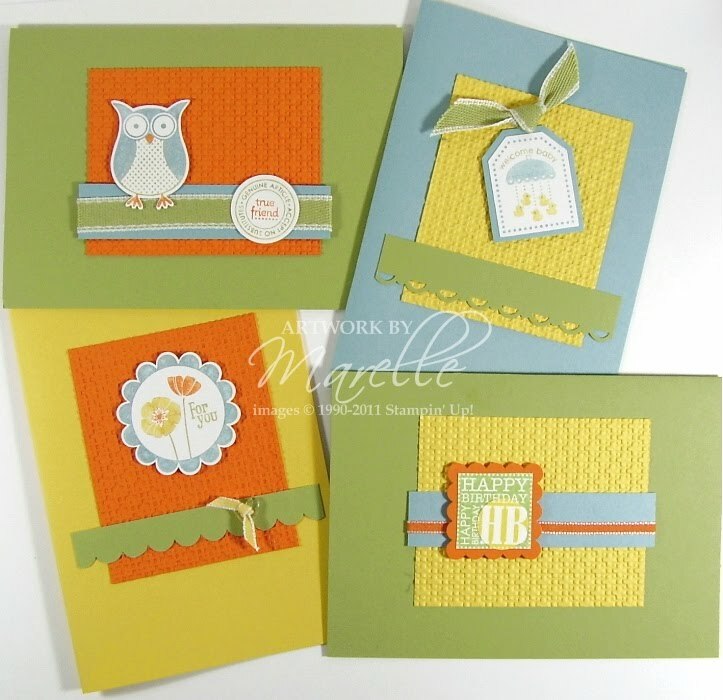 This was a Stamp-a-Stack I designed using the very popular Punch Bunch set. Bright colours from me for a change - Daffodil Delight, Pumpkin Pie, Baja Breeze and Pear Pizzazz. Hope you're having a lovely week! I have had a lot of problems using this set - don't know why but I love what you have done with them - also very bright colours for you!! !